How can you achieve comfort living? Switch ON, OFF and dim lamps, roll up/down the electric shutters and create custom SCENARIOs. This is YESLY comfort living. 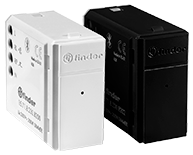 By installing a Type 13.72 actuator you can turn lights on/off. You can do it via your smartphone, by downloading the Finder YESLY app, or by using the BEYON wireless pushbutton. In addition, by installing a Type 15.71 dimmer you can also dim the lights. By installing a Type 13.72 actuator you can control 2 different lights (eg. an overhead LED and a table lamp) via the Finder YESLY app or using the BEYON wireless pushbutton. If you also install a Type 15.71 dimmer you can control the brightness and create the right ambience for just about every occasion. Thanks to YESLY you can control your lights and electric shutters. To do this you need to install a Type 13.72 actuator and, using the Finder YESLY app or BEYON button, you can roll your shutters up/down from the comfort of your sofa or bed. Thanks to YESLY you can create custom SCENARIOs for your rooms. Are you planning to watch a movie at home? Thanks to YESLY you can use your smartphone or BEYON to roll down the shutters and control and dim your lights to create the right atmosphere.